* Use between the hands extend the arms holding the yoga tie. Raise the arms over the head and down the back side. Come back up. Works to help loosen tight shoulders. * While bending over (at the hips) to touch the toes and you cannot reach them -wrap the tie under the ball of foot then grasp the tie in each hand to create traction and work with a flat back. * While lying on the floor with legs extended perpendicular, feet extended toward ceiling and the hamstrings are tight, wrap the tie across the balls of feet hold the tie in each hand resist the rounding of the back. Work with the legs straight. Draw the shoulders down to the floor away from the ears. Many variations. * Wrap the tie around the back at the hips and under the toes with the feet sole to sole knees open on baddakonasana (bound angle pose) Gives passive support to the release of the hips. * Tie the elbows together for more support in headstand and other inverted poses. Helpful when shoulders are tight. The Cotton YogaMat(tm) is for padding. 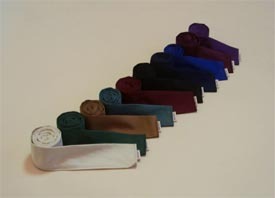 The cotton mat can be used flat, folded or rolled any amount as needed. A "sticky mat" (lightweight "rubber-like" mat) is to keep your feet from slipping. You would use them independently as they serve a different purpose. Or you could use them together, for example to keep the elbows stable in shoulder stand or to keep the mat itself from slipping. There are many sticky mats on the market. We carry the industry standard known as the Tapas( mat. Available in purple, or lapis blue and now emerald green. They come 24" wide x 68" long 1/8th" thick, light weight & ideal for traveling. Quantity discounts available on cut multiples or as large rolls (equal to 15 mats) which you cut. There is an extra thick mat just developed called the Tapas Ultra which is 1/4" thick, and only available in aqua & burgundy. NEW! Tapas Travel Mat. Thin, thin, thin! Lightweight & compact for travelling with same sticky support as the standard Tapas Mat. One cotton mat is equivalent to two or three blankets. Blankets are a common prop, yet there are many studios who now use and appreciate the versatility of the cotton mat. Cotton will compress pretty quickly to a firm dense pad with initial use. This is desirable in yoga for stable support. It handily converts to many versions of bolster without lengthy folding and adjusting as well. Our cotton mat has a washable cotton cover providing a smooth comfortable surface. Easycare. Chose a basic solid color or design your own with our range of decorative fabrics. Create your own personal space for your practice. It will invite you to participate more often! Comfort & beauty. You may roll the mat any amount to suit your needs of a pose. For a seated forward bend you would still have enough mat available for your legs at the same time that you are sitting on the rolled end. For some restorative poses you can telescope the roll to have graduated support for the back. Roll it in from either end to give support to the hips and knees as you sit in bada-konasana. Or for a simple shoulder opening with support for the head. Fold it either in half, 3rds or 4ths for shoulder stand. Can also be a simple square sitting cushion. Fold it into itself in 4ths for a rectangle bolster. Use it flat for floor poses. Fold over a small amount on one end as a cervical support for the neck. This is just a beginning suggestion. You are sure to find many others on your own. You may choose both to support your yoga practice. The sticky mat used in conjunction with the cotton mat for those times you need padding without slipping as in shoulder stand. Or to change back and forth between the two depending on the needs of the poses you are doing. Cotton makes a firm dense bolster. Kapok is more lightweight and springy. Cotton will flatten somewhat. Kapok is more resilient. Cotton is more economical, kapok more expensive. Zafus are traditionally filled with kapok because of its resiliency allowing it to become reshaped. Cotton will not do that. Yoga Mats are all six feet long and two layers thick (approximately 2" which will compress to a dense 1"pad. That is the nature of cotton and is desirable for the purposes of yoga, providing stable supportive padding. There are 3 widths. The 24" and the 30" conveniently convert to many types of bolsters. Rolled any amount, or folded in half ,thirds, or fourths it is creatively versatile. The 36" mat is wider and allows your arms to extend in "corpse pose"(relaxation pose) comfortably. ( You would be less likely to take that to a class due to space.) Works well as your sacred space at home. Establish your mat as an energy center, a place where you can go for renewal and nurturing then you can use it wherever you are. Shiatsu Mats are sized particularly for bodyworkers. The smaller especially compact for outcalls or the larger for the more fixed office location. Both are portable. You would choose according to the space you have available. There are auxiliary cushions to use modularly with either mat ( especially the smaller to extend the width as you work out the arms allowing for continuous support of the mat. You may use them for extra length at the head and foot. Or as more support for your knees. Choosing size may be dependent upon where you plan to use it. If you're going to be doing a lot of out-calls you may want to consider the 39" mat. With the auxiliary cushions (20" sq.) you can extend and work down the arms or provide extra room at the top/bottom of the mat for yourself including extra for you. The large shiatsu mat. The smaller shiatsu mat is more indicated for out calls. It's compact and slightly less weight. The additional 20" sq. cushions (same thickness) offer modular extension of the mat, for use when working out the arms for example as you need the extra width or at the head or feet. Simply extra padding for your knees. They are handy with the large shiatsu mat too, when it is not large enough to accomodate a partcular style of bodywork practice. Interchangeable. The round one is filled with cotton as a standard, the rectangle is filled with kapok. The round is heavier and denser and will over time become somewhat oval with use. Commonly used in yoga studios. The kapok fill is more shapable, lightweight and resilient. Easier on your back. A Zafu is the traditional round meditation cushion, a circle with pleated sides, fully stuffed with kapok. Small 6", standard 8". The Crescent Zafu is similar with pleated sides, fully stuffed with kapok yet it's crescent shape allows you to bring the heels/feet in closer to the body while having broader support for the sitzbones and the sacrum. This support helps you to tilt the pelvis which then allows you to sit with your spine straight. Tightness in the hips is common. The body grips and tries to hold itself together. Without support it won't let go. Yet with support the hips and the legs will gradually release their tightness without forcing . The body can then relax and sit tall comfortably over time,. 6" round zafu: for those who want to sit lower to the ground and carry a small pillow. Often people who attend ashrams and/or who will be sitting in large groups and don't want to take up much space. 8" round zafu: the standard size commonly used at Zen Centers and other meditation centers. For some the body is so stiff they need a lot of height. Some even need an additional support cushion ( such as the 20" sq. zabuton) as well. 15" rectangle bolster: some people ( many ashrams/centers) like this as a sitting cushion. It is filled with kapok same as the zafus. A matter of personal preference for choice. For zafus or crescent zafus the traditional fill is (as afore mentioned) kapok. Kapok will pack down somewhat with constant sitting, however it can be reshaped (as part of your meditation completion in preparation for your next sitting). Buckwheat hulls provide their own unique support. Like sitting in sand they will mold to your buttocks. They seem a little higher because the hulls don't compress really. They do make for a much heavier cushion. It is all a matter of personal preference. The PlumPillow developed out of a need for those of us who must sit higher for more comfortable sitting . It is styled like a hassock or a drum! which can be used upright for seiza sitting (bent knee) or on its edge for broader adjustable sitting. 10" tall, w/14" diameter. The buckwheat filling molds to your body. It is also wonderful for a supported back stretch (sit with your hips on the floor, lean your back over it, find the right spot and experience the "aaahhh" of a delicious deep breath!). It has a zipper closure and a handle for easy carrying. You will want to take it everywhere you sit on the floor! Great for all ages. Kids love them!! Since organic cotton is still quite pricey this is one way to get an experience of the luxury of organic cotton on the outside where it is next to your skin. Our conventional cotton is untreated material, it is the next best we can do considering the way it is traditionally grown. Three organic colors: Natural, earth red, smoky brown. Print fabrics: A range of florals and geometrics. Ask for swatches. Dyelots are subject to change without notice. Please include a second choice.